James O'Connor's Burnley career came to an end in May 2008 when he failed to agree a new deal to remain at the club. After some discussions the offer was withdrawn and he became a free agent. 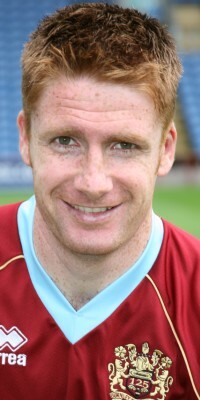 O'Connor was always a player who divided opinion at Burnley. Some fans would always point to his strengths whilst others were always more keen to point to his weaknesses. But, apart from one period at the start of the 2007/08 season he was very much a regular in the first team. The Dublin born midfielder started his career with Stoke City. He served his apprenticeship in the Potteries before signing as a professional and joining the first team squad, making his first team debut in a 2-0 Auto Windscreens win at Blackpool in December 1998 coming on as a substitute for Graham Kavanagh. His first start came two months later in a home defeat to Wrexham in the league, a game in which Mark McGregor netted for the visitors. Over the next four years he made no fewer than 176 league appearances for Stoke with everyone of them in the starting line up. There was considerable interest in him in 2003, and the Clarets were one club to be linked with him. His contract was at an end at Stoke and he opted to move to West Brom on a Bosman. Because of his age, he was 23 at the time, West Brom were forced to pay £250,000 for his services. His home league debut for the Baggies came against the Clarets in front of the television cameras. He played in a midfield alongside the likes of Jason Koumas and Artim Sakiri as they beat the Clarets 4-1 in the Saturday tea-time slot. That first season at the Hawthorns led to another promotion, this time to the Premiership, but having played a major part in the promotion he wasn't to feature at all in the higher league and in October 2004 took the opportunity to play some football again by joining Burnley on loan. He'd worked with both Steve Cotterill and Dave Kevan at Stoke and signed for the Clarets in time to sit on the bench at QPR. We suffered our heaviest defeat of the season that day (3-0) and he was soon on as we suffered injury after injury. He replaced Graham Branch. Once in the side that's where he stayed and his loan was extended to the maximum three months before he returned to West Brom at the end of January. There had been much discussion about him signing which was heightened when Richard Chaplow signed for West Brom, but he remained at the Hawthorns and even played in an FA Cup tie at Spurs coming on as a sub for Riccardo Scimeca. This was the last season Football League clubs were not subject to the transfer window and on the last day of the old Football League deadline Steve Cotterill brought him back to Turf Moor for £175,000, O'Connor signing a deal until the end of the 2007/08 season. He was straight into the side and even scored in his first game back which was a 3-1 win against a Watford side under the charge of Adrian Boothroyd for the first time. He stayed in the side for the remainder of that season and for the next two was a virtual ever present. In 2005/06 he started every game and the following season played in 43 of the 46 games with just four of them from the bench. His critics always suggested that he was Steve Cotterill's blue eyed boy, his fans continued to point to his contribution in the side. In that 2006/07 season, early that season, he found his very best form and even added a few goals including the openers in televised wins over Norwich and Preston. Things changed for him at the start of the 2007/08 season when he couldn't get a place in the team. There were rumours of a falling out with the manager but this simply wasn't the case. From the start of the season up to the day Cotterill left he made just one substitute appearance in the league, although he did play in all of our Carling Cup ties. He made his second substitute appearance at Leicester on the day Steve Davis was in charge and also made appearances from the bench in the early days of Owen Coyle. Then he got his opportunity when Alan Mahon suffered an injury and both Chris McCann and Joey Gudjonsson were sent off in the home defeat against Preston. That saw him back in the starting line up for the following game at Ipswich and that's where he remained. Players came back from suspension, they came back from injury, but they couldn't wrestle Jimmy out of the side and he held down his place for the remainder of the season. It came as no surprise, given that he was in the side, when manager Owen Coyle offered him a new deal, but when he said he wanted to see what else was available that offer was then withdrawn leaving him as a free agent. I've always been in the pro camp as far as Jimmy's concerned and have always believed he made a vital contribution in our midfield. I know others will refer to his poor passing ability, his small stature, his lack of strength, and some will say he didn't influence games. They've never convinced me. I think we'll miss him. He went to start a coaching course and said he would then decide on his future.. A number of Championship clubs were linked with him including Blackpool, Coventry and newly promoted Nottingham Forest, but initial speculation suggested he was likely to sign for Sheffield Wednesday ahead of the new season. On 27th June 2008 he signed a three year contract with Sheffield Wednesday. He has proved to be a popular player with the Hillsborough crowd and at the end of his contract was offered a further deal by manager Gary Megson, the very manager who had sold him to Burnley in 2005. The extension took him to January 2012. At that time he opted to leave Hillsborough and English football and signed for American club Orlando City. He remained with Orlando City and became player/coach under head coach Adrian Heath but in early June 2014 it was confirmed that Orlando City were selling their USL PRO franchise to a new club Louisville City and O'Connor would be moving to Kentucky to become the new club's first head coach, a club that would affiliate with Orlando City with their 2015 move into the MLS.